Russia’s new currency symbol has hit a nerve with the Orthodox Christian community, as they say it closely resembles a version of the ancient monogram for Jesus Christ’s name, Chi Rho. Andrew Kuraev, Archdeacon of the Russian Orthodox Church and Professor at the Moscow Theological Academy, blogged about his disappointment with the new ruble symbol, a day after it was adopted after an online vote. The new symbol is the Cyrillic letter ‘P’ with a horizontal cross in the lower half. Kuraev says the symbol approved by the central bank is an exact replica of the staurogram, which is a version of the Christian Chi Rho. He plans to take up the issue with Russia’s Synodal Biblical Theological Commission. 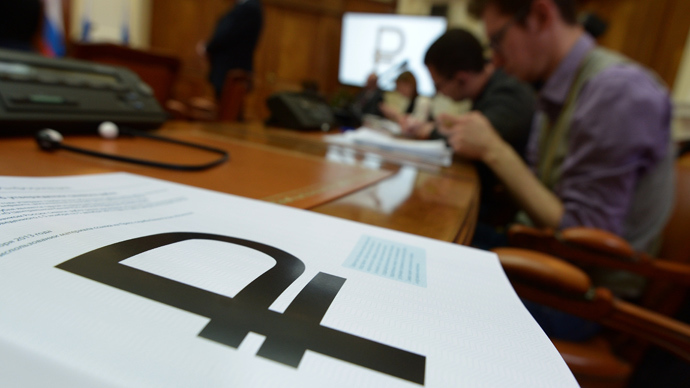 “The ruble symbol is an exact reproduction of an early Christian symbol of Christ. I just don’t know whether I should be happy about it or not,” Kuraev wrote on his blog Thursday. The shape of the Christian symbol has significantly transformed over the years, but the very ancient form is almost an exact copy of the symbol chosen by the Central Bank. “Take Lenin off the banknotes,” Kuraev wrote in his post, giving reference to the title of a 1967 poem by iconic Andrey Voznesensky, who rejected the Central Committee’s decision to put Lenin’s image on the currency, a call both brash and shocking at the time. Countries have traditionally reprinted sacred religious symbols on currency, and Russians kopeks depict St. George on horseback slaying a dragon, a practice Kuraev acknowledged in his post. The slogan “In God we trust” is printed on all American banknotes and coins, which has stirred Atheist movements to protest against the small print. Emperor Constantine II also printed Christ’s Chi Ro symbol on Roman coins in the 4th century. The adoption of the symbol is a historic first for Russia.The Central Bank first considered a new ruble symbol after the collapse of the Soviet Union – something similar to the $, € and £ signs to raise the international prestige of the currency. Talks were sidetracked by the financial default in 1998, and were only recently revisited. In 2014 the CBR will also issue a 1 ruble coin with the new national currency symbol. It will be promoted by the Central Bank and everyday use will be widely encouraged, from market exchanges to restaurant menus. The Bank will start to denote all monetary amounts using the new symbol, replacing the former three letters ‘RUB’. It could appear on Russian keyboards in the near future. Russia’s new symbol, according to bank chief Elvira Nabiullina is supposed to represent stability of the currency, which is depreciating as inflation grows.